1) Heat the ghee (or oil) in a heavy frying pan, add the onions, garlic & ginger and stir-fry until golden. 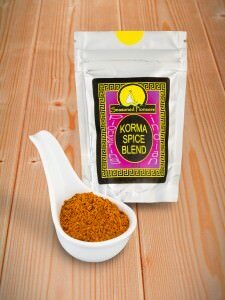 2) Mix in the Korma spice blend and fry for a further minute. 3) Add yoghurt, a couple of tablespoons at a time and stir-fry until moisture from yoghurt is evaporated. Repeat until all yoghurt added. 4) Add the chicken and fry for a further 3 to 4 minutes, then add the stock and simmer for 15 minutes. 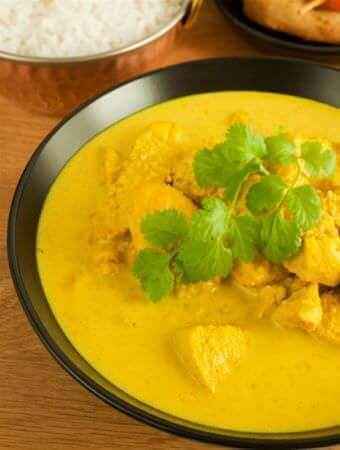 5) Stir in the cream & ground almonds and simmer gently until the consistency of thick cream. 6) Add salt & sugar to taste, garnish with toasted almonds & cashews. Serve hot with basmati rice (serves 4).